With the exception of the architecture boat tour, it might not seem like there are many alternatives to touring the city without some embarrassing element involved like hopping on a Segway. Not the case! There are infinitely cooler ways to pack in plenty of Chicago history and culture outside the droves of hovercraft-like devices. Embrace your inner tourist (maybe not the fanny pack) and witness the Windy City by land, water, or sky with these essential tours. Viewing the city from cloud level is definitely the ultimate way to gain a new perspective on Chicago's landmarks. Departing from the outskirts of Bridgeport, the chopper takes you on an epic aerial tour up the coast of Lake Michigan to Montrose Harbor and back. 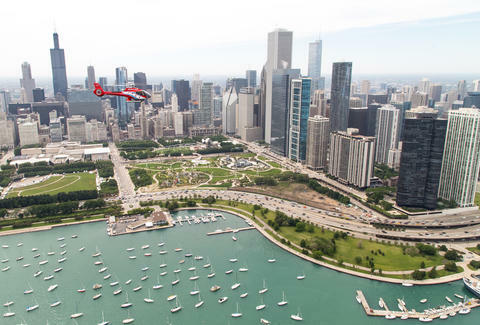 For 15 minutes of airtime and pilot-narrated history, it's certainly one of the most expensive methods of touring the city, but the views are unparalleled -- whether you're hovering in the daytime, golden twilight hour, or at night. Former Second City-performer Margaret Hicks treats tour participants to off-the-cuff storytelling that guarantees some entertainment. You'll get a comedy-laced, whirlwind history of Chicago's public art, architecture, and larger-than-life characters who helped shape the city through inexpensive 90-minute group tours of the Loop and underground pedestrian tunnel system. Binocular tours highlight high-up artistic details that often go unnoticed, and she'll customize private tours based on specific interests, even if you're only into fountains and gargoyles. Designs of the granddaddy of modern architecture inevitably warrant some expert attention. Combination tours like the Wright Around Chicago Tour offer in-depth, guided experiences via bus. 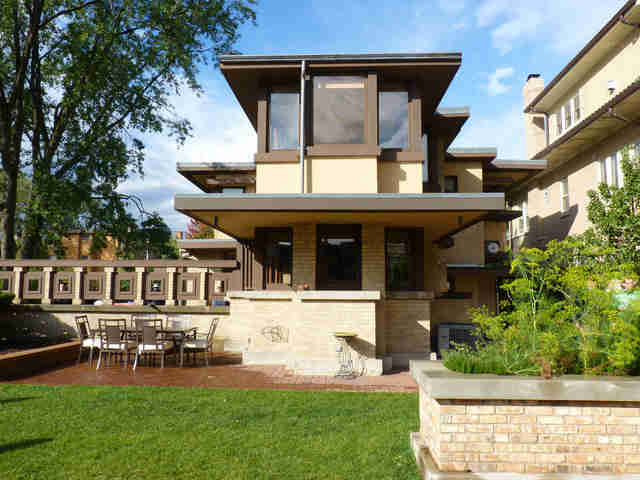 This one hits up celebrated landmarks in the Frank Lloyd Wright Historic District of Oak Park, such as the architect's home and studio and Prairie School masterpiece Unity Temple, plus The Rookery Downtown and Robie House in Hyde Park. This 90-minute Chicago River cruise explores three branches of the river and crams in more than 50 architectural wonders along the way. Certified docents aboard the First Lady River Cruises point out all the famous skyscrapers from River City north to Goose Island, filling in more narrative details than you'll probably be able to recall later. Unimpeded views from the river make it a go-to way to uncover the city's history through its breathtaking backdrop. Much as we value the river for carving through beautiful cityscape, we might love meat, cheese, and bread a little bit more. Pizza is one of the best ways to see and understand the city, and you can discover it one slice at a time by way of culturally significant neighborhood pizzerias. 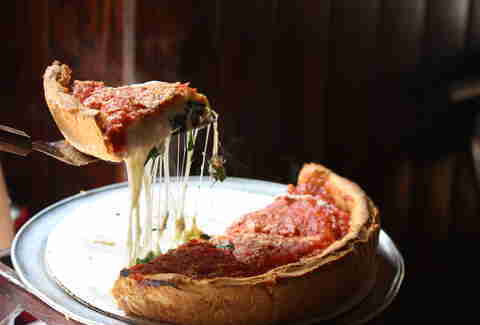 On the Original Chicago Pizza Tour, the aptly named bus, "Dough Force One," takes you beyond Downtown to power through an awesome three-hour foodie adventure -- accessing the kitchens of several restaurants and sampling signature deep-dish, stuffed, coal-oven, tavern-style, and Neapolitan pies. What could possibly top pizza and history? BEER and history. Chicago beer and tavern historian and author Liz Garibay connects people to the stories behind taverns through thirst-free tours, talks, and experiences. Since 2002, she's been tapping into the city's past through its pubs, proving that you can interpret and appreciate history from all different angles. Pub crawls and neighborhood-based tours, such as "Old Town Taverns," "Pints & the Past on Devon Avenue," and "Cubs & Pubs: Wrigleyville Taverns," walk people through Chicago's celebrated beer history. She's even taken the show on the road to other international cities, and collaborated to start Chicago's first Brewseum. You'll have to actually move your arms at a fairly steady pace to avoid colliding with all the architecture river cruise boats, but kayaking through the city can be an awe-inspiring and humbling journey. 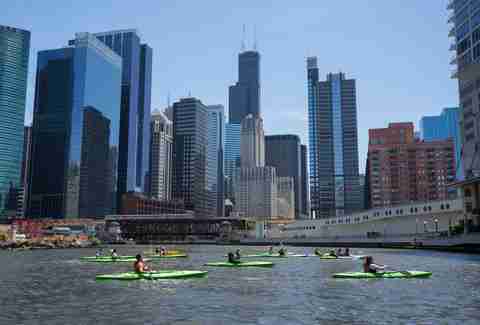 Discover the delicate balance of staying afloat while learning about the skyline architecture and city history along the Chicago River's main branch. The Ultimate Fireworks Outing caps off the 1.5-hour historic tour with a Navy Pier fireworks display. A Chinatown Guided Paddle Tour departs from a beautifully designed boathouse in Chinatown to explore the river's south branch. Ghosts, gangsters, mystery, and mayhem in the Windy City, minus the super-cheesy costumes and phony theatrics? Visit little-known spots around the city to uncover unusual aspects of Chicago. You won't find lame tours pushing fabricated legends and shoddy research here. The original Devil & The White City Tour delves into the history of American serial killer H.H. Holmes and the World's Columbian Exposition in 1893. Others embark on three-hour themed excursions to haunted places, Red Light District hotspots, 1920s speakeasies, gangster hideouts, and crime scenes that shaped the city's history. Knowing a friend who can take you around town is always a solid way to experience any city, and Chicago is no exception. But friends aren't always the most knowledgeable (unless made-up facts are your thing). Getting matched with a friendly, well-informed local to give you the inside scoop on the city for free (seriously, they work on a no-tipping policy) might be the smarter ticket. And did we mention the public transit bill is on the Chicago Greeter program? If you've ever taken Lakeshore Dr at night, you've probably witnessed the majesty of the city lights. The City Lights at Night Bike Tour cruises through Downtown to see Millennium Park, the skyline from jaw-dropping vantage points around Museum Campus, and Buckingham Fountain's light shows at night. The three-hour Lakefront Neighborhoods Bike Tour takes you along a seven-mile stretch of the Lakefront Trail and off the tourist-beat onto quiet neighborhood streets, city parks, and North Side beaches. Food & beer, Southside gangster, and sunset museum & parks are also options. Nicole Bruce is a contributing writer for Thrillist. She's an advocate for learning under the influence by mixing beers with history. Follow her on the Twitter at @nicoleabruce.